It starts with a jog that speeds up to a run. Next comes the 5K, 10K and then before you know it, you are signing up and training for your first marathon. Your preparation takes months of discipline, dedication and sacrifices over grueling and tiring long days, but in the end you wouldn’t trade the experience for anything. You compete. You feel the glory of finishing what you set out to accomplish. And now you can check one more item off your bucket list. Or perhaps your first marathon is the start of many. Kudos to you either way! When it comes to finding a marathon to compete in, there is no shortage of offered races in the United States. From the Big Sur Train and Whidbey Island Marathons in the West to the Mardi Gras and Lower Potomac River Marathons in the East, marathoners have hundreds of races to choose from each and every year. The decision typically boils down to location, timing and personal preferences. For marathon runners wanting a wonderful experience with the course, events and race management, below is my list of the top U.S. marathons, listed chronically by the next upcoming race dates. 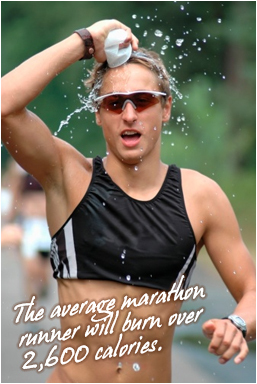 Any of these marathons will make your training and tireless perseverance all the worthwhile. Course Overview: Known for being fast and flat, this course offers a scenic tour of Chicago and its lively neighborhoods, as well as a convenient start and finish in beautiful Grant Park, attracting attracts both elite athletes and amateurs alike. Course Overview: Dubbed the “Most Beautiful Urban Marathon in America®,” the Twin Cities marathon is full of crowd support and exceptional scenery, starting at the Metrodome in Minneapolis and finishing at the state capitol. Course Overview: Three loop marathon with a fair amount of small hills and one large one at mile 17 well organized and caters to the runner, a large amount of spectators and lots of music a fun one to run. Course Overview: The course takes marathoners through the streets of New York’s five boroughs: Staten Island, Brooklyn, Queens, the Bronx, and Manhattan and finishing up in Central Park, uniting dozens of culturally diverse neighborhoods. Course Overview: The course runs on both sides of the Potomac, along the Mall, through Georgetown, past nearly every memorial in town, and back in a large loop to the Marine Corps’ Iwo Jima Memorial in Arlington National Cemetery. Course Overview: Runners start on Ala Moana Boulevard, Hawaiian for “path by the ocean,” go west along the waterfront toward downtown Honolulu, loop through downtown and head east through Waikiki before ending their hardships in Kapiolani Park. Course Overview: An entertaining run through all four parks, staring at Epcot, on to the Magic Kingdom, then to Animal Kingdom before finishing in Hollywood Studios with Disney characters cheering along the way. Course Overview: Full of glitz, glamour and maybe even paparazzi, the LA Marathon is more than a race; it’s a total community effort with support and encouragement at every turn of over 70 points of entertainment along the course and famous landmarks at every mile. Course Overview: Considered to be one of the more difficult marathon courses due to the Newton hills, near Boston College, the race runs through eight Massachusetts cities and towns: Hopkinton, Ashland, Framingham, Natick, Wellesley, Newton, Brookline, and Boston on Patriot’s Day every year. Course Overview: Featuring ideal running temperatures in a scenic coastal setting on a course that is as flat and festive as they come with upwards of over 40 bands play live music on 26 stages and,000 cheerleaders encourage runners to the finish line. Pickleball? Yes, pickleball and it has nothing to do with food, although I do love pickles. Rather it’s a racquet sport that was crafted in the mid-1960’s, combining the components of tennis, ping pong and badminton into one exhilarating game. Played on either an indoor or outdoor court that has the same dimensions as a doubles badminton court (20 feet by 44 feet) and with a net two inches lower than a tennis net (36 inches high on the ends and 34 inches in the middle), pickleball is played with wooden or graphite paddles that are like oversized ping pong paddles and a baseball-sized wiffle ball. Believe it or not, pickleball was invented accidentally, out of mere boredom by then Washington State Congressman Joel Pritchard and his friend, businessman Bill Bell. The two decided to create the game on the spot to entertain their families during a gathering at Pritchard’s home on Bainbridge Island, Washington. Everyone immediately fell in love with the game, including the Pritchard’s cocker spaniel, “Pickles,” who would often take the ball and then run with it since it was, after all, his ball. The families decided to name their new game “Pickleball” in honor of the beloved family pet. A third family friend, Barney McCallum, eventually joined in playing the sport and three gentlemen soon devised rules and regulations, basing them heavily on badminton guidelines. While the sport has been around for more 40 years, it didn’t become a mainstream sport until it was included in the annual Huntsman World Senior Games in St. George, Utah in 2003. The Senior Games is for athletes 50 and older and attracts some 10,000 participants competing in a number of sports. Since these games, Pickleball has taken off like wildfire, becoming addictive to those who try it. Once somebody picks up a paddle, they just don’t want to stop playing. Yes, it’s that much fun! Today, pickleball is the fastest growing sport in the U.S with pickleball courts sprouting up in all cities. Fun and easy, the game can be played by enthusiasts of all ages who have different playing abilities. It is simple enough for beginners to learn, but can develop into a quick, fast-paced, competitive sport for the experienced players. You also do not need a powerful stroke since this game is not about power but more about the shot placement and accuracy. Like tennis, games are played as singles or doubles. Points are earned only when you serve the ball. Games are played to 11. Most who give pickleball a try find it addictive and challenging. It also provides plenty of exercise, burning about 250 calories in 30 minutes for casual play if you weigh 150 pounds, 335 calories if you weigh 200 pounds. If you play more aggressively, then you can burn approximately 360 calories in 30 minutes if you weigh 150 pounds, 475 calories in if you weigh 200 pounds. Pickleball works most of your muscle groups at the same time and improves your balance, dexterity, mobility and agility. It’s great for interval training with its quick bursts of activity and intermittent resting. 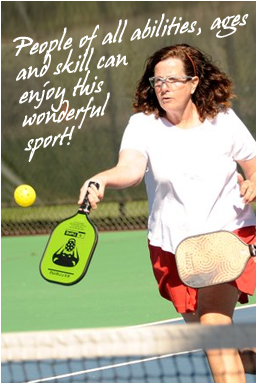 Pickleball also helps with speed, overall fitness, discipline, social skills, and even sportsmanship. What a fun way to stay fit! To learn more about pickleball, or find a facility close to your home, visit the USA Pickleball Association’s website. Many community centers and local YMCAs are also offering the sport. Just try it once if you have the opportunity. When you do, I’m certain it won’t be your last. Coming up, a group of friends and I will be going on a whitewater rafting day trip down the Lehigh River Gorge in Pennsylvania. After a brief crash course in river safety, we’ll climb into a group raft, wearing helmets and life-jackets, and then paddle down the feisty river on a dam-release day, which will hopefully mean Class II and III rapids. We’re promised a great ride on waves and bends in a steep-walled canyon where thick vegetation, rock outcroppings, and stunning waterfalls is to become the perfect backdrop to our tumbling rapids. This will not be my first trip paddling, screaming, and splashing my way down rocking rapids. My very first run was on one of the top 10 world-class white water rivers in the world, the upper section of the Gauley River in West Virginia. Located about 60 miles southeast of Charleston, the Gauley is over 100 miles long with more than 668 feet of vertical drops and over 100 rapids. Wow! The river is generally rafted in two sections by most outfitters and in three sections by others with both single day and two day trips offered. The most intense white water of the Gauley River is found on the upper section, which is the part I rafted. Your rafting experience will start at the base of the Summersville Dam where you’ll watch the release of the hydro-electric water, transforming the Gauley from a trickling creek to a raging river. (And, yes, it looks intimidating!) Once on your raft with paddle in hand, you’ll navigate through dozens of rapids. The most notable will be the “Big Five” Class V+ rapids: Insignificant, Pillow Rock, Lost Paddle, Iron Ring, and Sweet’s Falls, a 13-foot-waterfall. The Middle/Lower Gauley has fewer rapids that are more spread out, but also have a few big dramatic rapids that can pose challenges. The Upper Gauley rafting season is limited and runs every Friday through Monday after Labor Day and concludes on the third weekend of October in conjunction with the Bridge Day Festival—the world’s largest BASE-jumping event where jumpers jump off the 876-foot high New River Gorge Bridge. Onsite Activities: Two championship golf courses, indoor and outdoor tennis courts, equestrian center, full-service spa and nautilus fitness center, and more than 40 other activities on a private, 4,100-acre estate, including biking, rafting, guided fly-fishing, sporting clays, and more. Nearby Activities:Hiking, mountain biking, rock climbing, bungee jumping, fishing trips, jet boats and ATV tours. Getting There:The closest major airport is the Yeager Regional Airport (CRW), 52 miles away in Charleston, WV. Amtrak also has a route, the Cardinal/Hoosier State line, that travels to Charleston. Taxis and car rentals are available in Charleston. Otherwise, major roads and highways will get you there. Special Note: If you are a coffee drinker try Mattie’s Mountain Mud, a fresh-roasted organic coffee served by many restaurants in the area. The Secret Sandwich Society in nearby Fayetteville is a great place for breakfast and lunch with their incredible homemade sandwiches, chips, soups and pickles. Try the Jefferson, my favorite! 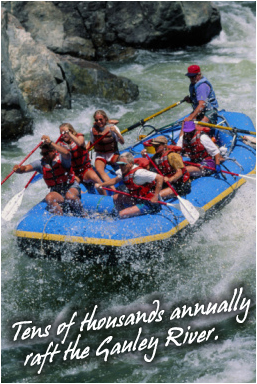 The rafting season in West Virginia is short, so book early if you are planning to raft the Gauley! There are plenty of other fit and fun activities to participate while there, so be sure to pack your sneakers, sunscreen, and hat. You’ll love staying at the Resort at Glade Springs, wishing you had discovered this place and rafting experience sooner. So gather your loved ones or friends and grab your bags, then head toward West Virginia for a wet and wild time. To me, there is something ever so alluring about water. Put me in a swimming pool, take me to a lake, or bring me to the beach, it is my instant nirvana when my eyes see a body of H20. So it will come as no surprise that I also love to play in the water, even being past 40. Swimming, floating, splashing, chilling, snorkeling … I simply love it all! This also includes boating of all types and its associated activities, such as tubing, waterskiing and wakeboarding. I remember the first time I went waterskiing. It was down in Florida. I slipped on the vest, slid my feet into the skis and sat patiently at the end of the dock waiting for the boat that would pull me to be ready. I had snowed ski for years. How hard could waterskiing be? When it came time to go, the boat gently took off and I instantly began gliding across the water. All my years of snow skiing came into play as I picked up waterskiing as if I had done it for years. What a great rush! Last summer was the first time I tried wakeboarding. This time I was at the Jersey Shore. Again I slipped on a vest, but this time I stood on the back of the boat on the water trying different stances. Should I lead with my left foot or right? I thought back to my skateboarding days and knew the left lead felt more natural. When it was my turn, I jumped off the back of the boat with the board hinged to my feet and drifting away while adjusting my rope. I waved to the driver and he slowly placed the boat into gear. What a refreshing surprise when I popped right up out of the water, during my very first attempt, and began swishing side to side as the boat pulled away. These two water sports are an amazing feel. 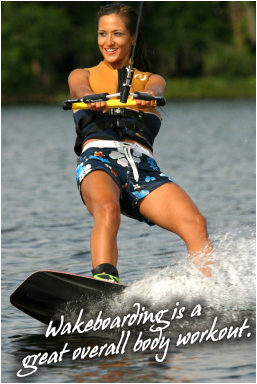 Since waterskiing and wakeboarding are so much fun, one can easily forget how they also make great workout activities. One of the biggest benefits is that it is a complete body workout, exerting just about every major muscle group from your head to toe, especially once you begin holding yourself up with the taut rope which also improves your balance and coordination. Your quadriceps, hamstrings, calves and gluteal muscles will all be worked in addition to your abductor and adductor muscles from all of the lateral moves across the water. Looking for a new fat burner? 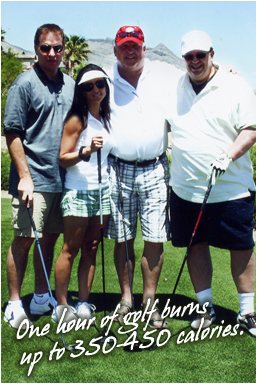 Well, these warm weather activities are also an excellent means to burning calories and fat. A 150-pound person can easily lose over 400 calories an hour. A person with more body mass even more. Waterskiing and wakeboarding will also boost your metabolism and lift your mood … that is as long as you remain up on your skis or board! Waterskiing and wakeboarding are also excellent ways to stretch and strengthen your leg muscles, particularly in the thighs and around the knees, as well as help with joint mobility. Your endurance will increase, the longer you stay up and more frequent the trips, as will your stamina. These sports also help to build your overall strength and agility, develop long lean muscles, and tone your entire torso. What is there to loose in trying these water workouts? Even if you do lose your balance and fall in, you are left with treading water and swimming, two more excellent exercises. It’s a win-win situation all around. So the next time you have the opportunity to water ski or wakeboard, give it a try. You might find two more sports to add to your beloved list of activities just like I did. One of my favorite types of vacations is one that includes athletic endeavors. It brings out the tomboy in me and places my endorphins into overdrive. May it be barreling down a snowy steep mountain, zipping through trees in a hot dense jungle or snorkeling in cool clear water among colorful tropical fish, there’s almost nothing better than getting that rush and workout. I decided to share this passion of mine and some of the fine getaways that allow tapping into the inner athletic side in all of us. 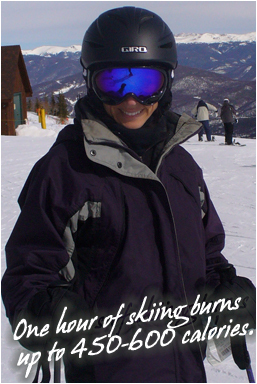 Stay tune for future fit and fun travel blogs such as skiing in Utah, sailing in the Virgin Islands, rafting in West Virginia, ziplining in Maui, mountain biking in Pennsylvania, hiking in Colorado, snorkeling in the Cayman Islands and European adventures. This edition features jumping horses in sunny outdoor rings, riding through endless wooded trails and cantering across wide open cross-country courses in lovely Vermont. This is not all that is available in this New England state. Read on to learn more. Two hours north of Albany, New York in central Vermont sits Mountain Top Inn and Resort in scenic Chittenden, a hidden haven for riding horses, enjoying an assortment of outdoor activities or just kicking back lakeside with spectacular mountain views. Just 11 miles from ski magnet Killington, Mountain Top Inn sits on 350 acres of spectacular property with sweeping views of a mountain lake and the Green Mountain National Forest and creates a comfortable respite from day-to-day stress and pressure. Here you will find over 37 miles of trails right on the property for riding, running, biking and cross-country skiing … a private lake for swimming, canoeing and kayaking … and a first-rate equestrian center for riders of all ages and experience levels. 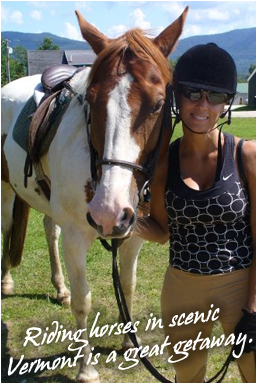 Mountain Top Inn is one of only a few resorts in the Northeast to offer horseback riding getaways for the experienced horseman to the novice rider. Guests can board their own horse or use one of the Inn’s many horses and can choose from lessons in English or Western, guided trail rides with breathtaking views, dressage, stadium jumping, cross-country jumping and more. There is also a summer horsemanship camp for children six years and older. For those traveling who would like to do more than just ride, the Inn’s private beach on the lake offers kayaking, canoeing, scenic pontoon boat rides and swimming. Also available onsite is clay bird shooting, hiking, mountain biking, tennis, volleyball, croquet and more. Right next door to the property is the Green Mountain National Forest with 400,000 acres that stretch across nearly two-thirds the length of Vermont. The Main Lodge has 33 comfy guest rooms and five classic mountain cabins that are also pet friendly. There are three restaurants onsite covering all three meals; the Dining Room serving New American cuisine with a world-class wine list while the Tavern and Terrace serve casual bistro style fare. Picnic lunchesare also available. When playing is done for the day, you can relax by receiving one of their many massages, including Swedish, Shiatsu, deep tissue or hot stone. Whether you are in search of a riding adventure, romantic hideaway or a fit and fun get away, Mountain Top Inn and Resort in Chittenden has something for everyone. So pack up your bags, jump in your car and head toward Vermont and get ready for a wonderful fun and healthy vaca. Getting There:The closest major airport is the Rutland Southern Vermont Regional Airport (RUT/KRUT), 16 miles away. Amtrak also has a direct train line from Washington, DC to Rutland. Both taxis and car rentals are available in Rutland. A second major airport is the Lebanon Municipal Airport (LEB/KLEB) in New Hampshire, 49 miles away. Otherwise, major roads and highways will get you there. Special Note: A must place to eat breakfast is the Maple Sugar and Vermont Spice Restaurant in neighboringMendon, VT. Not only do they make their own maple syrup, this simple eatery also serves scrumptious homemade waffles, pancakes and other breakfast items and has a country store filled with Vermont goodies. Try the pumpkin pancakes, my favorite! Whether you are in search of a riding adventure, romantic hideaway or a fit and fun get away, Mountain Top Inn and Resort in Chittenden has something for everyone. It’s a great choice. So pack up your bags, jump in your car and head toward Vermont and get ready for a wonderful fun and healthy vaca. Cycling is a favorite of mine. Growing up, I spent hours zipping around neighborhood roads on my purple bicycle with a basket up front. It was the mounting speed and feeling of freedom that was the draw. On the leg-powered, pedal-driven vehicle, I would follow my two big brothers on their adventures, explore the area with my best friend Maria, travel to the nearby tennis courts to play a few sets or just plain ride for the sheer joy of it. It was relaxing, it was exhilarating and it was pleasurable. Today, I have added four bikes to my collection; one mountain, two road and one stationary while my beloved purple bike remains safely stored at my parents’ home. I’m also shopping around for a new race bike to help increase my speed during the cycling leg of tris, my most favorite stretch of the event. Yes, I still find riding relaxing, exhilarating and pleasurable. The biggest difference is that I no longer ride for hours or as frequent. This is not because of my schedule constraints, but more due to my own body composition and how quickly the fast twitch muscle fibers in my quads react and build from this resistance-filled workout. There is no doubt that riding a bicycle, may it be stationary or on a path, is an excellent form of exercise. For starters, it’s simple, easy on your joints and is great for people of all ages and all fitness levels. You can make it low or high impact, break a sweat or ride with ease, take it to the mountains, ride a road or bike inside. It can also help slow down the aging process and help you sleep more soundly at night. Bike riding is one of the best cardiovascular workouts available. 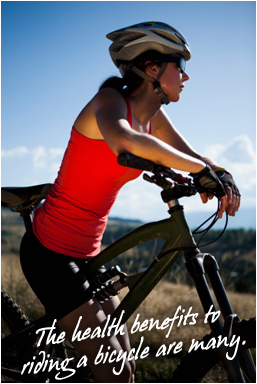 Those who ride regularly are at a decreased risk of diabetes, heart disease, high blood pressure and weight gain. It reduces stress, anxiety and depression, and depending on your intensity, can burn about 500-600 calories per hour. Riding also improves your balance and flexibility, increases your endurance and stamina and your leg strength, and enhances your overall cardiovascular fitness level. When it comes to riding outdoors, there are an assortment of bikes to choose from including road, mountain, BMX, hybrid and good old-fashioned casual. A road bike is great for long distance riding with its light frames, thin tires, curved handle bars and 10-20 gears. Mountain bikes are perfect for riding off the beaten path and are typically made with a light to medium heavy frame, knobby tires, a low straight handle and over 20 gears. BMX bikes are to ride all sorts of terrain, such as dirt, street, and ramps. They have a heavy-duty frame, thick knobby tires, raised handlebars and just one gear. Hybrid and casual bikes are a cross between road and mountain bikes with a medium frame, thin tires with small nubs, a straight handle bar and 0-24 gears. Both are perfect for riding leisurely. There are three different types of stationary bikes when riding indoors: upright, recumbent and spin. The first two typically have numerous levels of resistance and various preset programs built right into the bike to personalize your workout at your fitness level. The biggest difference between the two is the seat. A recumbent bike places you in a reclining position with your legs straight out. This reduces strain on your spine. The upright and spin both sit like a traditional bicycle with the spin bike more true to road bike as it also allows you to clip into the pedals. Spin bikes are usually just available during spin classes where you will typically ride to heart pumping music and under the direction of a very motivating instructor for a hard but exhilarating indoor ride. Bicycling is nearly a life-long activity. You can go solo, ride with family and friends or compete in an event. Any way you choose, it’s a great way to get fit and stay healthy. So get out there, get moving and get riding! Splish. Splash. Swimming is a Blast of a Workout. Ever since I was a child, I love to swim. Maybe it’s my Aquarius zodiac sign to blame, but regardless, I would swim every day if I lived in a hot climate year round or had a heated pool behind my house. But mainly due to my weekly schedule and all my other commitments, I only manage to get in two to three swims in a week on average. My preferred times to swim at the gym is at the crack of dawn or late in the evening. With goggles tightly wrapped, cap securely on and one ear plug in my left ear, I swim 30-40 laps nonstop, depending on my restlessness of swimming just laps in a single lane. I do have an underwater MP3 player, but have yet to use it. Contrary to a popular belief, swimming is not great way to drop excess pounds. While you burn a good amount of calories while swimming, it isn’t as effective with the calorie burn with cardio activities on land. Swimming burns about three calories per mile per pound of bodyweight. So if you weigh 150 lbs. and it takes you 30 minutes to swim one mile, then you will be using approximately 900 calories in one hour. The serious swimmer easily achieves that or better, but the recreational swimmer typically does not swim at the speed, distance or duration so their calorie burn is significantly lower. Also, once you get of the pool, the calories stop burning unlike exercising at land when the increased calorie burn can continue up to 18 hours after your workout. Nonetheless swimming is an excellent workout and is one of those exercises that, once learned, can be performed well into the late ages of life. The low impact exercise tones your entire body and provides an excellent cardiovascular workout with little strain. Regular swimming builds endurance and builds muscles. Swimming also strengthens your heart and improves the delivery of oxygen to your muscles. It can also better your blood pressure and help to lessen a chance of injury with the total body workout. There are psychological benefits as well, such as complete relaxation, stress reduction and a form of meditation. I love it so much because of the endorphin high I get during and afterward plus the overall toning and conditioning. There are no phones underwater, no interruptions, no pressure, no demands; just you and the clear blue water. Ah nirvana, at least for me. For my swim workouts, I mainly swim freestyle, but sometimes will add the breast and back strokes to work other muscles. I often use swim paddles to strengthen my stoke mechanics, a kickboard to work my legs, and a pull buoy to push my upper body. I would also use training fins more regularly, as I love the quickness I gain through the water by using them, if it weren’t the muscle build I quickly gain with the added resistance. Whentraining for an upcoming triathlon, I will then do a lot of sprint work in the water to simulate what I will be doing in the first leg of a sprint tri. In addition to swimming laps, one can participate in a water aerobics class, water walk or jog, or participate in a water yoga class and other options at a nearby gym or swim club. What is so great about swimming is that it exercises almost your entire body – heart, lungs, and muscles included – with very little joint strain. It is great for general fitness and it’s great for anyone at any age. So now that it’s summer and warmer weather has arrived, hopefully you will find an opportunity or two to get out there and splish splash about and make your own wonderful waves.